This fervent, unapologetic geek was very pleased last Tuesday to receive her pre-ordered copy of Star Trek Reboot. The next week or so was spent viewing and savoring the delicious nerdy goodness. I even coerced the roomie and Lisa into watching it–both of them sat down thinking they’d just humor me for a few minutes, and then…excellent. This film confirmed a long-lingering suspicion that has dogged me since I first began watching Star Trek: Vulcans are Asians. 1. 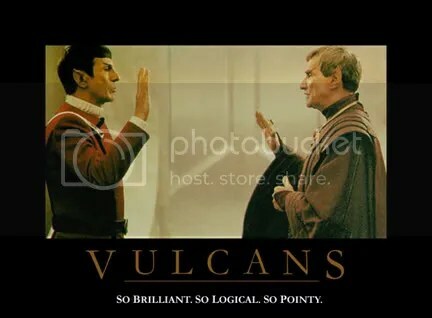 Vulcans like logic. They don’t express emotion. The stereotype goes something along the lines of Asians are rather logical as well; brainy, calculating, very good at math and science. Model minority much. Learning: on Vulcan, it’s the pits! I mean, it’s the Vulcan Science Academy that Spock applies to, for chrissakes. I can’t really picture a Vulcan liberal arts college. 2. Vulcans are the perpetual aliens. Anyone who knows an ounce of Asian American history gets this. For no good reason, two Spocks for you. 3. Vulcans are…mysterious! Cue the erhu music. The first time I really listened closely to the music in the theater, I turned to my dad and said, is that a freaking erhu?! For the most part I love Giacchino’s soundtrack but the erhu/Vulcan theme always makes me squirm. 4. Vulcan homes look like zen retreats. Not the best image, but this was from Enterprise episode “The Awakening”. Please take off your shoes before you come in. 5. The clothes! 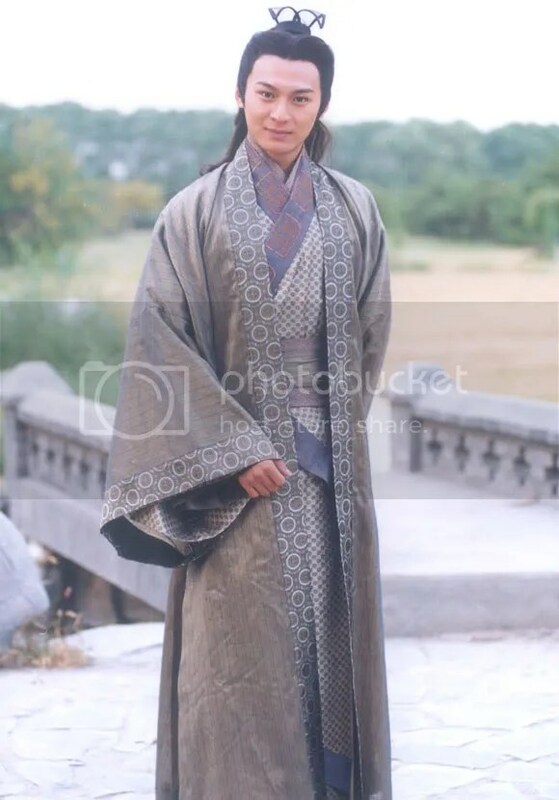 Vulcans dress like Han dynasty Chinese. 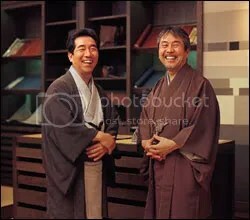 Or, if you prefer, in Japanese kimono. 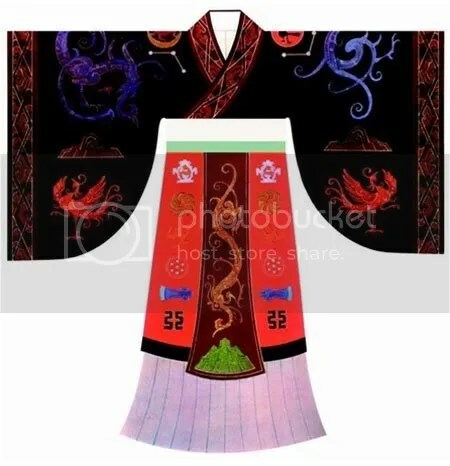 (Except that Japanese kimono are derived from Han dynasty clothing, thus confirming my mother’s assertion that everything, including Japan and Star Trek, was invented by the Chinese.) This influence was not so pronounced in the older incarnations of Trek, particularly in TOS and TNG, where Vulcans wore what looked like pajamas decorated with gigantic rhinestones. But it’s definitely noticeable in the Enterprise series, as well as in First Contact. I’m not sure what happened in the reboot movie, where the Vulcan outfits look like some barfy Edwardian-middle ages-Galliano grab-bag. But I guess the erhu makes up for it. 6. And I have saved my most potent proof for last. I admit it. 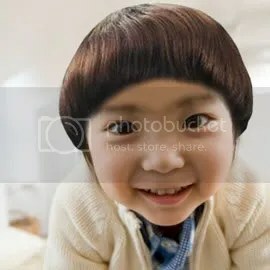 Every Asian child I have known–including myself–has been subjected to the bowl cut. Perhaps Vulcans will finally make this ‘do cool. Star Trek, I love you. And Vulcans, I love you too, although love is an illogical emotion for your species and my race. Just kidding. Glad we could hash this all out. Live long and prosper. This entry was posted in science fiction, television and tagged Star Trek, Vulcans on November 24, 2009 by apricot. I find this entirely persuasive. “I love you too, although love is an illogical emotion” — lol! It’s hard not to love the pointy. Oh, so pointy. i like the perpetual alien thing. i’m the first half generation irish of my family but will always be taken for north american over my asian friends who’ve been here for three generations. chris, I haven’t thought about zen meditation and the pacifism thing…v. interesting. It all stands to reason. Asians are descendants of extraterrestrials who colonized Earth hundreds of thousands of years ago. These e.t.’s also settled Mars and dwell in underground cities on Mars. Originally, from the Pleiades Cluster out of a proto-Vulcan stock. This is also so of Native Americans (whose DNA carry these genetic markers). Actually from Omega Centauri rather than the Pleiades cluster. Alpha Centauri; not just Omega Centauri. By the way – we checked to see if he was a superglue-hand-victim (Trekkie joke). HE WAS!!! LOL! We almost fell off the sidewalk! He really was that cute!!! I always thought Vulcans were slightly Asian, although never in the obvious ways that you pointed out. It’s not that obvious in ST:XI, eg. the Vulcan bullies seemed more like American hick rednecks than Asian whiz kids, and the stuffy old Vulcan councillors wouldn’t have been out of place in a Charles Dickens novel. I actually think it was a lot more obvious in ST:TOS, where I felt they deliberately cast actors who looked “Oriental” to play the Vulcans (eg. T’Pau, T’Pring) and gave them “Oriental”-looking make up. Costumes aside, the Vulcan women’s elaborate hairdos looked particularly Asian and T’Pau looked like some kind of Mongolian priestess. But I guess I used to feel the same way around Africans so maybe all humans have some degree of ingrained xenophobia. I just wish people would get over it. I think that Westerners generally do see Asians as “other.” Less so than other groups, perhaps (thank you, model minority myth–I do mean that sarcastically), but there it is nonetheless. I don’t really take offense, because none was intended, but it does induce a bit of the ole eye-roll on my part. Humans will probably always function on the in-group out-group basis. Whether that separation is by race, gender, class, etc., it’s going to stick with us one way or another, as much as we wish it would go away! I think the best we can do is to be aware of our own prejudices. All that said, in terms of Star Trek (which I will always love, unreservedly), I really like the Vulcans. They could do far worse in terms of awful/awkward Asian stereotypes in scifi (I’m looking at you, Ming the Merciless). You fail to recognize that Asians often see themselves as ‘other’, even more so than Westerners. I’ve always been amazed at how even 2nd and 3rd generation Asian Americans who speak perfect English and no other language often refer to “Americans” as though they do not see themselves as Americans. As for the model minority myth, it is a myth, but not in the way you suggest. It’s a myth because nobody in the real world actually uses that term. It’s a concept invented by nervous white liberal academics who obsess on race. In reality, what I observe is that there are very roughly two types of Asians in the US, those who are shamelessly assimilated and those that are envious of the pity and attention blacks and Hispanics recieve. They do not resent being seen as model minorities but in fact resent the fat that they aren’t seen as minorities at all. These are the types that join Asian clibs in college and parrot the angry race rhetoric used by blacks (which frankly, is laughable). They’re embarrassed by the fact that Asians are generally well accepted by caucasians and wish they were seen as ‘oppressed people of color’ like blacks and Hispanics. Of course, the crazy part is that many Hispanics are actually fully caucasian Spaniards descended from white suremacist imperialists. The white Spaniard is clearly the big winner in the sick game of American race politics. They were on top as whites in the days of slavery and segregation yet (due to the widespread historical and anthropological illiteracy of most Americans) they benefit today from affirmative-action and political correctness because they are seen (irrationally) as ‘oppressed people of color’. So swarthy Greeks, Italians, and even French who are indistingusihable from many Hispanics are labeled mean, priveleged whities yet their Spanish cousins are seen as oppressed victms. It makes absolutely no sense whatsoever. Oh yeah, and I always did think that “Live long and prosper” sounded like a Chinese saying, since Chinese people are so obsessed with wealth and longevity. as in Gong Xi Fa Cai ? I suppose it’s more like ‘福如东海寿比南山’–‘May your fortune be as boundless as the eastern seas and your life as long as the long lasting southern mountains’. But again there are sooooo many phrases in China that are about Living long and prosper. All I know is Vulcans and Chinese definitely have something in common. 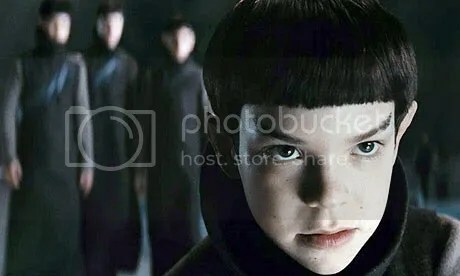 I suppose the bowl cuts look Asian but I don’t really think you can say that Chinese are emotionless, I would rather say Germanic people are emotionless but hmm… The clothing Vulcans and Romulans dress in looks like ancient clothing from everywhere on Earth, and it is not always portrayed as silky so I don’t think the Vulcans can be modeled solely on Chinese – as the Chinese do have liberal arts. In my personal opinion I view Vulcans as traditionalist nature worshiping Pagan peoples of Northern Italy and central and east Europe whilst the Romulans represent the all conquering Roman empire. 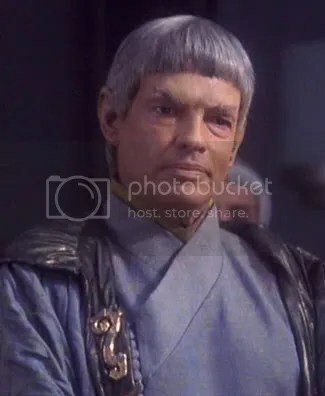 Vulcan (Vuk, Volk – Volf, because of the pointy ears) Romulans are also Vulcans. 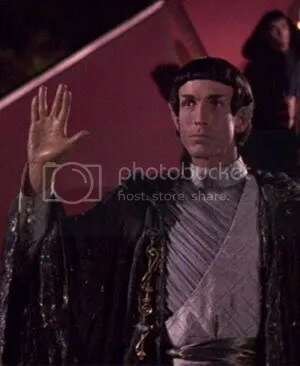 Most importantly though, we must remember is that Vulcans are make belief and what created them is imagination as well as taking many good aspects found in people on earth in order to present them as a superior species. There is nothing to debate here; Star Trek creator Gene Roddenberry openly acknowledged that the Vulcans were based on East Asians (the Klingons were based on Middle Easterners). In fact, in one original series episode, Kirk describes Spock as “obviously Chinese”. In the latter day Star Trek the Vulcan’s ‘Asian-ness’ and the Klingon’s ‘middle eastern-ness’ is less pronounced. They even had a black Vulcan on one of the latter day shows, which (no offense, blacks) I thought looked ridiculous. It’s fairly obvious, isn’t it? The bowl hair cut, the lack of emotion, the logic/scientific orientation, the exotic culture. A tad stereotypical perhaps, but probably more flattering than insulting. If anyone should be offended it would be Middle Easterners. It kind of provides some insight into the way white Americans perceive ‘alien’ cultures. If such a show were made in Japan or China, I suspect an alien race modeled on Europeans would probably be some big lumbering Neanderthal like creature. 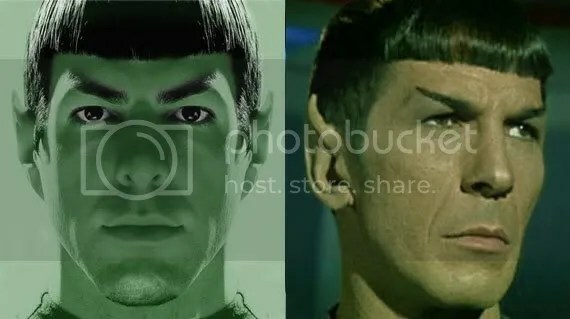 Spock chinesse? Maybe I am biased but Vulcans look ore like japanasse/coreean than chineese/vietnamese. As a what asians call a westerner that admires some aspects of the asian culture I have noticed as a result of many movies that chinesse people tend to have more round faces as opposed to the japanesse that have oval faces. You can confirm or infirm this. In the TOS and TNG the asian idea is not visible but look at the animated series, especially the “Yesteryear” episode. If tat is not japanesse, I do not know what is. Also please note that the single noticeable differene between asians and caucasians as far as I can tell is that asians seem to have the eyes a bit different shaped for some reason. Actually, there is a long-lived phrase in Chinese philosophy ‘存天理灭人欲’ basically it means ‘Uphold Logic and Nature’s Law, Annihilate Human Desire’. It was first proposed by Confucius at about 500BC. At that time, his actual word was ‘克己复礼’ which means ‘subdue one’s self and return to propriety’. Then about 2000 years later, a philosopher called ZhuXi (Ming dynasty) who worked on neo-confucianism bring this concept further to ‘存天理灭人欲’ (‘Uphold Logic and Nature’s Law, Annihilate Human Desire’). So…in my opinion, it is very clear that Vulcans represent Chinese before Qing dynasty especially from Ming and Song.